The animator-auteur Hayao Miyazaki has announced his retirement many times before, most famously after the success of Princess Mononoke (1997). Unlike most retired people, he has continued to make films, winning an Oscar for Spirited Away (2001) and receiving a nomination for Howl’s Moving Castle (2004). He has claimed that his latest, The Wind Rises (out in the UK on 9th May), really will be his last. “This time I am quite serious,” Miyazaki told theAssociated Press last year. By some counts, this is his seventh retirement. Since that interview, his friend and co-founder of Studio Ghibli, Isao Takahata, has hinted that Miyazaki may find another project. He will be forgiven if he does decide to break his promise again—Miyazaki is no self-promoting cynic. His films are about people who are trying to do the right thing: to prevent disaster or to save a loved one. His female characters, young and old, are more human than almost anything Hollywood serves up. Even his villains are not as bad as they seem—they often end up getting on pretty well with the other characters. This sounds worthy, and a recipe for commercial disaster. Yet Miyazaki’s animations are not only hugely popular, they are regarded as some of the greatest films ever made. Part of the appeal is the observational detail that he brings to every scene. The critic Roger Ebert once noted the “gratuitous motion” in his films, which Miyazaki likens to the Japanese concept of ma or emptiness—those little reflective pauses in which we notice an animal shaking itself free of water, or a colleague straightening his waistcoat. These moments create a kind of visual poetry, a celebration of the beauty in the everyday, like the graphic novellas of John McNaught. Miyazaki is a master of these moments. His films would rather make each moment beautiful than cut to the chase, and Miyazaki has no one to curtail his vision: he writes the scripts, designs the storyboards and draws thousands of key frames himself. The Wind Rises is ostensibly the biography of Jiro Horikoshi, a pioneering aeronautical engineer who was responsible for designing the Mitsubishi A6M Zero Fighter used by the Japanese Navy throughout the Second World War. Although a real historical figure, Miyazaki presents Jiro as a Harry Potterish everyman and tweaks his life story to accommodate his own preoccupations. When Miyazaki was a child in the 1940s, his father and uncle owned an aviation company that made parts for the Zeros, ensuring that no one in the family was conscripted to fight. Planes appear everywhere in Miyazaki’s work: the ominous shadows passing over the city in Howl’s Moving Castle before an air raid; the possessed paper planes inSpirited Away; the young neighbour’s toy plane in My Neighbour Totoro. And then there’s Porco Rosso, which is about a pig who is a bounty hunter and pilot. There are almost as many planes in that film as there are people. The Wind Rises begins with a plane. We first meet Jiro as a sleeping child. In his dream, he climbs up onto the roof of his house and gets into a plane with feather-tipped wings, rising up vertically with perfect dream logic. But up there, in the sky, are monsters, loitering on bombs like the shadowy pilots in Howl’s Moving Castle. Jiro falls and lands… in reality. He has woken up. The mosquito netting around him is blurred. He puts on his glasses and the room comes into focus. Here we are introduced to one of the most surprising elements of Miyazaki’s final film: it is set in the real world. His final challenge to himself has been to create a film without strange creatures or transformative curses. This world is governed by normal physics, so much so that the (animated, fictitious) camera has a depth of field and is susceptible to lens flare. Many of Jiro’s conversations concern the precise aerodynamics of the plane he’s designing. We see drawing board diagrams and designs in other Miyazaki films such as Porco Rosso and Totoro, yet in The Wind Risesthere is a new attention to physical reality. We watch over Jiro’s shoulder, like a supervisor, as he notes down the calculations on his slide-rule. Jiro is an underdog, determined to make a plane to rival the industrial powerhouses to the West, despite Japan’s poor resources. Through his nightly dreams, and days of hard work at his desk, he renders a whole new reality. It couldn’t be a more literal analogy for Miyazaki’s work. Later, the engineer marries a painter—another fitting metaphor. The film is full of painterly skies and sunlit fields, sea and mountains. We see a cherry tree blossoming, moths gathering around lamps, the smoke from a cigarette or a cold breath curling into the air. We watch dappled light move over Jiro’s body on a woodland walk, and even see the shadows of objects offscreen, the silhouette of an unseen tree running across the floor and up the side of a building. There are no serious antagonists in The Wind Rises. The most important relationship in the film is the love affair between Jiro and Naoko. When she was a child, Jiro saved her and her nanny from the chaos of an earthquake, carrying them from a railroad as burning detritus blew overhead from the city. Now she is a beautiful woman, Claude Monet’s Woman with a Parasol come to life, and she has found him—but, like the mother in My Neighbour Totoro, she has tuberculosis. Jiro and Naoko love each other devotedly, and decide to marry despite her being almost bed-bound, and his being wanted by the interior ministry. It would be hard not to smile at their courtship, watching them throw paper planes onto each other’s balcony, or make youthful declarations to one another. The central conflict in the film comes from the plane itself. It is the perfect meeting point of the opposing forces that shape Miyazaki’s attitude towards technology: freedom and destruction, one sometimes necessitating the other. In Princess Mononoke, which echoes the earlier film Nausicaä of the Valley of the Wind, Ashitaka fights against a human society obsessed with building ever more efficient guns. Miyazaki is always careful to show how technology consumes. The candle that powers the steam boat in Ponyo runs out, and there is a constant stream of coal in Kamaji’s boiler room in Spirited Away. Technology can also, sometimes, provide us with a seemingly limitless freedom, captured so well by his vehicles: the magic Cheshire Cat bus in My Neighbour Totoro, which bounds across landscapes in an instant, or the famous moving castle whose doors open onto different cities. In The Wind Rises, the plane embodies all of these qualities at once, belching exhaust fumes, describing perfect ellipses in the sky. It can kill even as it fulfils one of humanity’s great dreams, to fly among the clouds. Some critics, both in Japan and in America, have criticised the film for supposedly glorifying Horikoshi’s contribution to the war. In fact, Jiro suggests during a design briefing that they remove the guns and, at one point, even finds himself strolling through the wreckages of crashed Zero fighters. If the film had come on any stronger with its anti-war message, it would have been patronising. Perhaps the criticism stems from the claim by Jiro’s role model, Caproni, that “aeroplanes are beautiful dreams.” The criticism is presumably that we mustn’t gloss over the brutal devastation of war; that every film set during a war should strive to imitate Schindler’s List. But in Miyazaki’s work, no one sets out to do evil, even if the result creates conflict. In Princess Mononoke, the humans are not making guns because they are malicious, but to protect the vulnerable and their livelihood. Every character is simply trying to further their own cause, or to perfect what they already do well. If only Jiro would play the villain, we could all condemn him, refuse to understand why he lived the way he did, and learn nothing. Jiro is certainly not perfect, and his dogged quest to produce something beautiful puts a strain on his relationships with those around him. Caproni understands this impulse perfectly. He has been a kind of spirit guide through the film for Jiro, and ends by reassuring him that his work is over, and that “artists are only creative for ten years.” All that remains is to be grateful for the time that he had. Miyazaki has been making films for far longer, of course, and his most recent have been among his best. It seems hard to believe that he will retire now. He is getting older, of course, and his artistic process is immensely demanding. But the real clue as to why Miyazaki has declared The Wind Rises his last film may lie in his childhood. In 1945, when Miyazaki was four, the city where he lived with his father the aeroplane engineer, was bombed. The family was evacuated to a railway bridge. The sky was pink with flame. They got hold of a truck and, as they escaped the city, a woman and a child asked for a lift. But Miyazaki’s family drove on without stopping. It was an apparent failure of kindness, and he wondered later if it could have happened differently. Soon after the war ended, his mother contracted spinal tuberculosis, and underwent treatment for the next eight years. Watching The Wind Rises, it feels as though this is the story Miyazaki has been coming round to all these years—the final, realist vision to resolve all those recurring images of planes, burning skies, the woman and child in need, the debilitating tuberculosis of a loved one. Over three decades, this raw material has provided fuel for his gorgeous fantasy. Now, at last, it has been transformed back into reality. Which Miyazaki character are you? 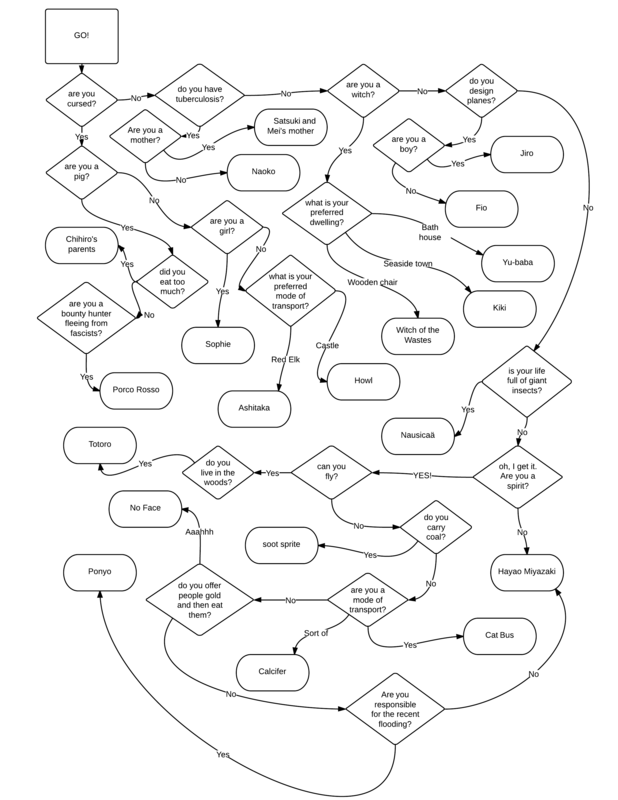 Follow the flowchart and answer the questions to find out which character you are. Click to enlarge. Just a bit of fun while I wrote my review of The Wind Rises. It seemed to me that there were a lot of interesting points of crossover in his films, so I thought I’d get most of them down while they were fresh in my mind.